In the history of the Hellenic Air Force the Starfighter has played an important role. A big number of aircraft have been in use during 30 years, between 1964 and 1993. The first Starfighter came from the Canadair factory in Montreal and a few years later some aircraft arrived directly from Luke AFB after being used intensively for NATO F-104 pilot training in the early sixties. Greece acquires 45 F-104G (35 built by Canadair and 10 by Lockheed) and 6 two-seat trainer TF-104G (Lockheed) under MAP funding. They arrive at 114 Wing and the 335 Fighter Bomber Squadron is formed with them. Greece lost a reasonable number of aircraft, which were compensated between 1977 and 1988 when ex-German and ex-Dutch Starfighter arrived after they had been replaced in their countries by more modern fighter aircraft. 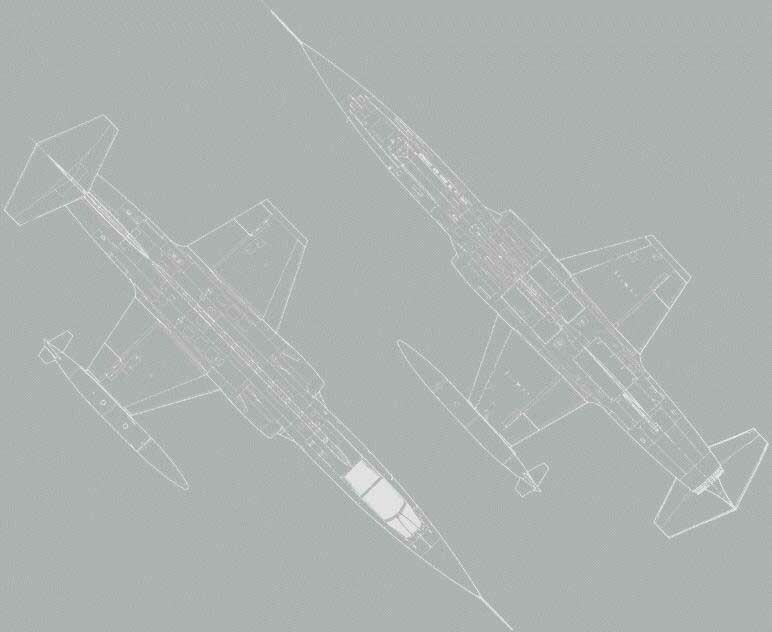 Only two Hellenic Air Force squadrons have been using the Starfighter, being 335 "Tiger" Mira and 336 "Olympus" Mira. The first F-104 squadron became 335 Mira from the 114 Pterix (Wing) based at Tanagra AB. The first aircraft arrived there in April 1964. F-104s operated with 335 squadron from April 16, 1964 on. Hellenic F-104s arrived in Piraeus by ship in March 1964 and transferred by trucks to 114 Wing at Tanagra. Some days later 335 Mira participated in the National Day parade over Athens on March 25, 1964. Sister squadron 336 Mira, still based at Araxos AB, (squadron operated simultaneously F-84F and F-104G) received their Starfighter between December 1964 and January 1965. On January 15, 1965 the "Spider" squadron was partially equipped with the new F-104G fighters, and the F-104 section moved to the 114 Pterix (Combat Wing) at Tanagra AB. 336 Mira started F-104G operations in early 1965. Almost 2 years later, at December 19, 1966, the 336 Mira moved to the 116 Pterix based at Araxos AB. The 335 Mira kept flying from Tanagra AB until June 30, 1977 when it joined the 336 Mira at Araxos AB. From that day until early 1993 all the remaining F-104s flew from Araxos AB (116 Pterix) until their retirement. In June 1972 a lot of 9 F-104G and 1 TF-104G, ex Spanish aircraft, were obtained under transferred MAP funding. 335 "Tiger" Mira (squadron) received 10 RF-104G aircraft and formed a separate "Photoreconnaissance Flight" in December 1987. 335 squadron (Mira Anachaitisis (Interceptor Squadron)) deactivated in May 1992. 336 "Olympus" squadron (Mira Diokseos Bombardismou (Fighterbomber Squadron)) deactivated March 31, 1993. March 31, 1993 was the official date for the withdrawal from service in the Hellenic Air Force (EPA: Elliniki Polemiki Aeroporia). The list is based on construction numbers! 4001: 61-2601, preserved (dump) Larissa AB. 4009: 61-2609, crashed July 5, 1971 due to a fatal engine compressor stall. 4024: 61-2624, F-104S prototype "2624"; crashed November 27, 1969, cause is unknown. 6001: 62-12302, crashed with 335 Mira May 4, 1974. 6002: 62-12303, stored (dump) Araxos AB. 6003: 62-12304, gate guard at Andravida AB. 6004: 62-12305, crashed April 23, 1991 (unconfirmed !). 6005: 62-12306, stored (dump) Araxos AB. 6006: 62-12307, display (preserved) at Araxos AB in base collection on a parade ground. 6007: 62-12308, crashed September 23, 1987 flying into mountain Mount Ossa, in Thessalia (CFIT). 6008: 61-12309, crashed May 8, 1969 at Patraikos Kolpos (Golf of Patras). 6009: 62-12310, stored (dump) Araxos AB-fuselage only. 6010: 62-12311, stored (dump) Araxos AB-fuselage only. 6013: 62-12314, stored (dump) Araxos AB-fuselage only. 6014: 62-12315, stored (dump) Araxos AB. 6016: 62-12317, stored (dump) Agrinion AB. 6017: 62-12318, crashed January 22, 1979. 6018: 62-12319, crashed November 12, 1974. 6020: 62-12321, crashed January 15, 1973. 6049: 63-12697, crashed February 24, 1976. 6056: 63-12704, crashed July 15, 1965. 6057: 63-12705, crashed after June 1974. 6058: 63-12706, stored (dump) Agrinion AB. 6060: 63-12708, display (preserved) in TIGER markings in 335 Mira area at Araxos AB. 6062: 63-12710, stored (dump) Agrinion AB. 6063: 63-12711, crashed November 21, 1978 into the sea at Kyllini, unknown reason. 6064: 63-12712, stored (dump) Araxos AB-fuselage only. 6065: 63-13713, stored (dump) Araxos AB-fuselage only. 6066: 63-12714, crashed January 18, 1968 at the weapon range of Marathona, cause unknown. 6067: 63-12715, ex C.8-1, display on pole at Tripolis AB in bare-metal color scheme. 6069: 63-12717, ex C.8-3, "FG-717" display at Heros of Polytecnics Square in Kifisia, Athens. 6071: 63-12719, crashed January 27, 1987 at Gastounis, Ilias. 6072: 63-12720, ex C.8-5, preserved coded "FG-720" Tiger colors at Hellenic AF Museum, Tatoi AB. 6073: 63-12721, crashed April 28, 1977. 6074: 63-12722, stored (dump) Araxos AB. 6075: 63-12723, crashed December 16, 1966, unknown reason. 6076: 63-12724, display (preserved) at Trikorfo, near Messini, Ithomi coded "32724"
6077: 63-12725, crashed on May 25, 1989 near Messina. 6078: 63-12726, crashed on June 19, 1965 at Tanagra AB, during landing. 6079: 63-12727, ex C.8-6, crashed January 25, 1978 while flying through heavy weather. 6081: 63-12729, crashed (no further information). 6082: 63-12730, ex C.8-7, preserved (stored) with Arms Museum collection at Messolongi. 6086: 63-12734, ex C.8-16, display in Vassiliada, 30 km SW of Kastoria, Kastoria Prefecture. 6087: 63-13638, ex C.8-17, stored (dump) Araxos AB. 6088: 63-13639, ex C.8-18, stored (dump) Araxos AB. 6092: 63-13643, ex C.8-12, "FG-643" restoration at BA Torrejón, ALA 12, Spain, code 104-12. NEW! 6125: 64-17780, crashed January 15, 1980. 6126: 64-17781, display (preserved) Nea Anchialos Airport. 6127: 64-17782, preserved near a Military camp at Agio Andreas, City of Patras coded "FG-782". 6132: 64-17787, stored (dump) Araxos AB. 6133: 64-17788, stored (dump) Araxos AB. 5501: 61-3025, crashed in March 1969 with 116 Wing. 5512: 62-12267, crashed coded "TF-267" March 16, 1987 at Messinia near Meligala. 5517: 62-12272, crashed May 8, 1964 due to engine failure on final approach at Tanagra AB. 5518: 62-12273, crashed July 31, 1972 while performing flight training during acrobatics; possible pitchup. 5519: 62-12274, preserved (restoration) Tatoi AB (LGTT), Athens. 5520: 62-12275, crashed August 22, 1967 at Tanagra AB after a compressor stall during takeoff. 5523: 62-12278, ex CE.8-21, stored Tatoi AB (LGTT), Athens (fuselage only). 7057/21+88; 7080/22+10; 7082/22+12; 7087/22+16; 7088/22+17; 7090/22+19; 7094/22+21; 7097/22+22; 7106/22+29; 7151/22+70; 7152/22+71; 7153/22+72; 7155/22+74; 7163/22+81; 7167/22+85; 7168/22+86; 7172/22+89; 7176/22+93; 7180/22+97; 7183/23+00; 7195/32+12; 7201/23+17; 7203/23+19; 7205/23+21; 7206/23+22; 7207/23+23. 7409/26+63; 7415/26+69; 7420/26+74; 7421/26+75; 7422/26+76; 7424/26+78; 7425/26+79; 7426/26+80; 7427/26+81; 7428/26+82; 7429/26+83; 7433/26+87; 7434/26+88; 7435/26+89. 6629/21+07; 6639/21+09; 6642/21+11; 6662/21+13; 6664/21+15; 6665/21+16; 6672/21+17; 6674/21+19; 6676/21+21; 6677/21+22; 6678/21+23; 6679/21+24; 6690/21+29; 6691/21+30; 6692/21+31; 6693/21+32. 6679 crash 18.09.1990 on landing at Larissa AB, scrapped.